No one else is in charge of cooking duties. Oh, you thought moving away from your parents’ house meant no more chores? Think again. Taking out the trash and cleaning up the bathroom are entirely on you now! You quickly lose all sense of shame in the privacy of your own home. To put on pants, or not to put on pants—that is the question. Furniture shopping actually gets you excited. The home and lifestyle section of the department store has never looked more inviting to you. You learn the value of giving things a second chance. No time for laundry? No problem! There’s no need to hunt down a fresh shirt every morning when the clothes you wore only last week are right there on the chair, ripe for the picking. They’re still clean, stg! Snail mail is no longer quite so charming. You become infinitely more resourceful. Who knew you were a DIY prodigy, amirite? That shoe rack you repurposed from a broken ladder works just as well any you can buy at the store! You love, and at the same time hate, having guests over. The freedom to throw a party whenever you feel like it? Pretty awesome. Having to clean up after everyone once they’ve all left? Not so awesome. Freebies are treated like gold. You hoard those condiment packets that come free with you delivery like nobody’s business! You can now relate to your parents so much. Adulting is HARD. Nowadays, you’re wondering why you gave your folks so much grief over having to turn the lights off every time you leave the room. You have to learn how to cook, otherwise you’ll starve (or get on a first name basis with every delivery boy in the area). Sometimes though, even when you know how to cook, you just don’t have the time or the energy for it, especially when the only one eating is you. 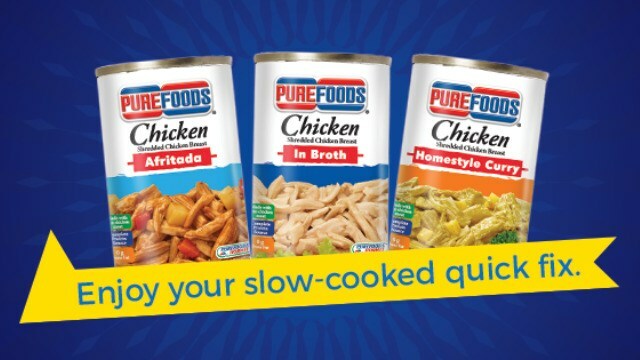 Which is why canned food is a godsend to people living by themselves, especially something like the ready-to-eat Purefoods Chicken—which comes in three variants: Afritada, In Broth, and Homestyle Curry—because then you can enjoy a flavorful dish without having to turn on the stove! All you have to do is pop open the easy-open can, top on hot rice, and you have a hearty meal! It’s tasty convenience at its best and perfect for anyone toughing it out on their own.